Camden is the fastest growing local government area in Australia. The Camden area is undergoing massive change as its population booms. MIA IORFINO asked local residents, business people as well as Camden Council about the challenges of such a rapid rate of growth. For almost its entire existence Camden was a quiet country town where most people knew each other and the main street was like a social gathering every day. But all that started changing about 10 years ago when Camden was made the heart of the State Government’s South West Priority Growth Area, which will deliver about 110,000 new dwellings when completed. There are 18 precincts in the entire growth area and 11 of them are in Camden. This means Camden Council governs over the fastest growing local government area in Australia. Camden’s population is forecast to increase from the current 88,000 to almost 230,000 by 2036. Which means the pace of change in Camden is not going to slow down any time soon. “Camden will continue to experience a high level of development over the next 30 years,’’ says a council spokesperson. The good news is that continuing population growth is also impacting economic growth in the Camden area, which has increased in recent years, with a current annual growth rate of a massive 14.9 per cent. Also on the plus side is that Camden has got a really good deal out of the State Government in agreeing to provide such a big chunk of its land for housing. “Council is heavily investing in local services and infrastructure to cater for the influx of residents to the area,’’ says the council spokesperson. Current major projects include the upgrades to the Mount Annan Leisure Centre, development of the Macaria Art Gallery, the new Oxley Street Carpark, Oran Park Library, and the nearly completed Narellan Sports Hub. At the same time the Camden Town Centre Urban Design Framework is being developed which will provide a structure for the direction of Camden Town Centre, an area of major concern for residents and local business people. “Council is also working with the State Government to deliver new roads within the growth area as part of a Housing Affordability Fund (HAF) and is engaging with the State Government on important discussions around future rail and other infrastructure needs,’’ the spokesperson said. On top of the massive population boom, retailing in the old Camden town has been affected by the growth of Narellan Town Centre and new shopping facilities in Gregory Hills and Oran Park Town. Camden’s administration building in Oran Park Town. On top of that council has moved its administration offices to a purpose built building in Oran Park Town from John Street and Narellan. “As the community continues to grow, so must council in order to deliver the services the community needs and requirements,’’ says the council spokesperson. “Previous council offices at Narellan and Camden weren’t able to cope with the projected increases in staff numbers. “Operating out of two separate administration buildings was also difficult for a number of reasons. “In 2012, council resolved to relocate to Oran Park to allow for future growth and the provision of continued quality services and facilities. The big concern for businesses in and around Argyle Street isn’t declining numbers of shoppers but the perennial lack of parking. Queen’s Charcoal Chicken owner Peter Drakakis says council needs to improve parking facilities for Argyle Street retail precinct. “Narellan is starting to boom; people are going to shopping centres because they are able to find everything they need and parking is convenient,” he says. 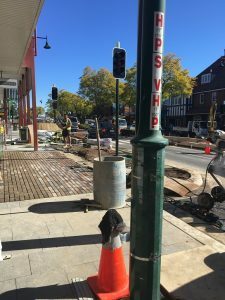 The main street in Camden remains highly regarded by Council and great care and consultation is undertaken in continuing its upgrade, says the council spokesperson. Argyle Street revitalisation works in July last year. 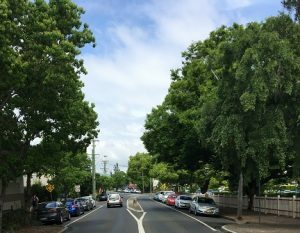 “The revitalisation of Argyle Street in Camden will widen a section of the road median between Elizabeth Street and Edward Street to again improve the safety and visual appeal of the historic town centre,’’ the spokesperson said. “These works will help ensure the traditional main street appeal of the Camden town centre remains relevant to the growing local government area. A recent decision was the establishment of the Camden Region Economic Taskforce, which will be charged with charting Camden economic growth. Mr Drakakis says he welcomes the growth of the Camden area as a good change, but it’s also important to retain the rural feel of the area. “Camden has already changed,’’ he says. Long time Camden resident Maria Nittis says more public transport should be on the agenda for a growing Camden. “We need to offer viable transport options, other than cars,’’ says Ms Nittis. “The problem with Camden is that we are 15 to 20 minutes from the nearest train station. Maria Nittis shares the concern of Mr Drakakis and many others that Camden is at risk of losing the charms that made it an attractive place to live. “I would hate to see Camden lose many of the things that drew people here in the first place,’’ Ms Nittis says. “I think we need to avoid multilevel apartments, keep our green spaces and our community markets. ♦ A Camden resident, MIA ORFINO is studying journalism at the University of Wollongong. She is currently in the third-year of a Communications and Media/Journalism degree, majoring in Global Communication and Journalism.